Located about 6,000 light-years from Earth, the Heart and Soul nebulae form a vast star-forming complex that makes up part of the Perseus spiral arm of our Milky Way Galaxy. The nebula to the right is the Heart, designated IC 1805 and named after its resemblance to a human heart. 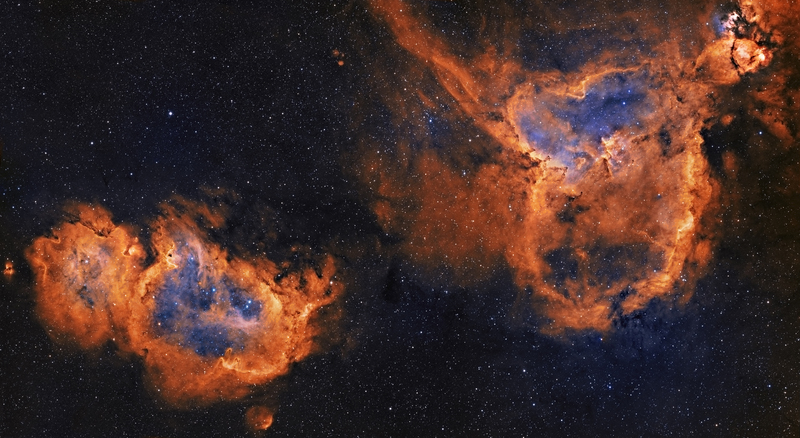 To the left is the Soul nebula, also known as the Embryo nebula, IC 1848, or W5. 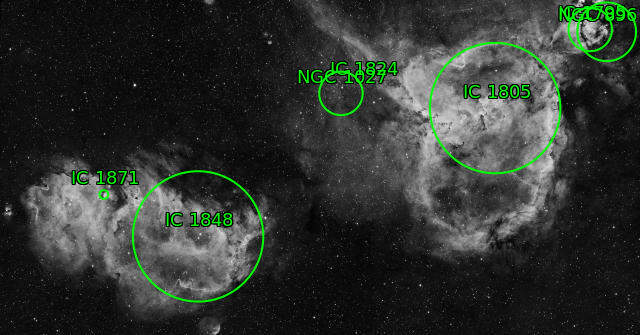 The two nebulae are both massive star-making factories, marked by giant bubbles that were blown into surrounding dust by radiation and winds from the stars. C: Atik 460EXM with 3nm Ha and OIII filters. This is a 6 pane mosaic. This totals 70.5 hours of total integration time.